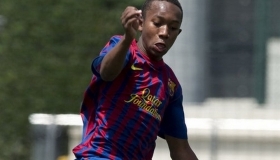 Josimar is yet another youngster to have come out of Barcelona's fabled La Masia academy, and this kid looks to be the real deal. In the summer, Chelsea moved quickly to snap up the Ecuadorian; and that's for good reason, this youngster is going to be something else. The 17-year-old decided to swap Barcelona for London and completed a transfer for Chelsea, following the likes of Cesc Fabregas of recent years to the bright lights of the Premier League. With the player signing a three year contract at Stamford Bridge, Quintero will continue his development under the watchful eye of Jose Mourinho until at least 2017. The Ecuadorian youth international is comfortable playing anywhere in attack or in midfield, but it is understood that his favourite position is the wing, where he can cut inside and take on a defence with an explosive change of pace and exceptional dribbling skill. Josimar is arguably the best player to come out of the South American country since Antonio Valencia of Manchester United and Chelsea were delighted to have wrapped up a deal for the player, beating off the likes of Sevilla, Arsenal and Lazio to the 17-year-old's coveted signature.